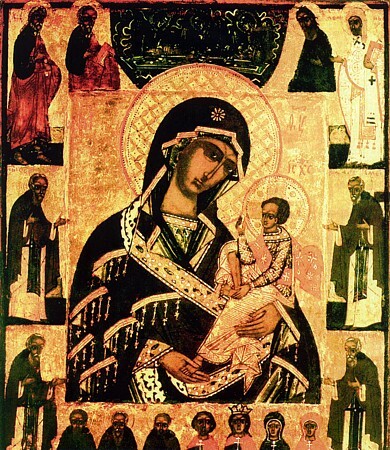 The Shuisk-Smolensk Wonderworking Icon of the Mother of God was written in the years 1654-1655 in the Resurrection parish of the city of Shui, where at the time raged an unrelenting pestilence. Hoping on the mercy of God and the intercession of the Mother of God, the parishioners of the Resurrection [Voskresensk] church commissioned a certain pious monk to write the image of the Smolensk Mother of God, – from of old being a rescuer of the Russian people from enemies and misfortune. The whole week while the image was being written was spent by the parishioners in prayer and fasting. When the icon was finished, the priest and the people took it to the church and set it in a specially built place. From that time the pestilence began to ease, at first in the locale of the Voskresensk parish, and then also in all the city. From the Icon of the mother of God set up in the church were done many miracles of healing, especially of eye diseases. Celebration of the icon is done also on 28 July.